Are ladybugs good luck? The ladybug has been a long-time good luck symbol in the Western world. It isn't surprising this beneficial insect found its way into the Western culture's move to embrace feng shui along with ladybug luck. The fact ladybugs are actually a North American insect and aren't native to China, is the first giveaway that this insect isn't a Chinese feng shui symbol. How were they adopted as a feng shui good luck symbol? That question is easily answered when you consider the westernization of feng shui, especially the cookie cutter form of Black Hat Sect, often referred to as the "Western fast food feng shui." This is a great example of the blending and adaptation of a different culture. It's indoctrination into feng shui good luck symbols was probably inevitable since ladybugs have long been an American icon of good luck. There's no documentation to show when the tale of a ladybug bringing good luck originated or why it's such a magical good luck symbol. Like all myths or legends, you can usually find a kernel of truth hidden within the story and this one is no different. One possible source of this superstition may come from gardeners. The vital role ladybugs play in maintaining a healthy garden certainly elevate their status in the natural world. The ladybug is a predator of destructive insects like aphids that can attack flowers, and especially vegetable plants. This natural predisposition as a predator of garden pests raised the ladybug to the status role of a beneficial insect for any garden. 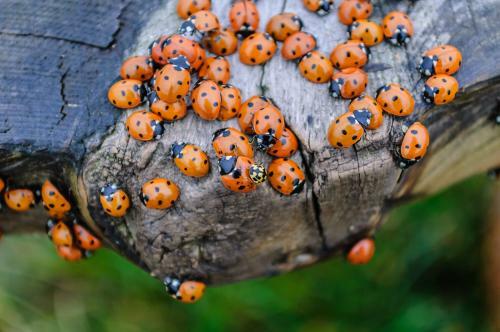 The love affair with ladybugs didn't stop with simply using them as an organic gardening method for pest control. Icons of the red insect with tiny black dots infiltrated the marketplace that even included fashion. Healthy plants as a result of ladybug defenders eventually translated into symbols of health and prosperity. Are Orange Ladybugs Good Luck? It's very common for people to mistake the Asian Beetle for a ladybug since it, too, ranges from red to light orange and has tiny black spots. Asian Beetles are known as a house pest while being beneficial to gardens much like their American cousin. Just because the ladybug is a Western culture feng shui good luck symbol, doesn't mean you want to allow it or an Asian beetle infestation to remain in your home. Some people mistakenly believe such a massive number of beetles will bring them excessive good luck. This congregating of insects is considered clutter. If you've ever had such an invasion, you know that it's very prolific and seems never-ending. You should set out traps specially designed for Asian Beetles and remove them from your home. It's important to find out how the insects are gaining access into your home and take steps to seal up any entry points. Feng shui principles are very specific about excess in any form whether it is a natural element like water, fire, metal, earth, fire or unwanted insects. Anything that invades your space is considered to be clutter. Allowing insect pests to take up residence will upset the balance of the chi energy in your home. It's the same thing as accumulated dust, stacked papers, cluttered drawers, dirty dishes in the sink and any number of other types of clutter. Some of the ways that you can incorporate ladybugs into your feng shui design is to add the symbol to a specific sector of your home. Remember, the symbolism of the ladybug is one of protecting vegetables from harm. Consider this trait when deciding where to place your ladybug symbol. Perhaps you want added protection in your wealth sector or maybe you'd like to place the symbolic ladybug in your health sector. It's always best when adding any feng shui element to make sure it belongs and makes sense to place it in your home. If your home is a formal style, then you don't want to just toss a ladybug pillow onto your Louis IV settee. This will not only look out of place, but will have the opposite effect. Feng shui principles dictate that all things in your home should work together in harmony to create balance and keep the chi energy flowing. This type of addition to a décor will stick out like a sore thumb and can impact the harmony and balance of your feng shui design. For this formal type of décor, you might choose a small brass or cloisonné ladybug to place on an end or coffee table. It's important to think through your design process before adding any feng shui designs or elements. There are several superstitions when it comes to ladybugs. All seem to radiate from the insect's positive influence over pest control in gardens. Is It Bad Luck to Kill a Ladybug? Accordig to superstition, if you kill a ladybug, you'll have bad luck. This superstition may have sprung from the fact that farmers depend on the insect to help keep the aphid and other insect pest populations down. This is not a feng shui principle, however. You may have heard that if a ladybug lands on you and you don't shoo her away and allow her to fly away on her own, that you'll have good luck. This is a superstition and not related to any feng shui truths. Another superstition is if a ladybug lands on you, something wonderful is about to happen to you. If you see a ladybug, you'll have good luck. If a ladybug lands on something like a car, furniture, appliance, house or some other object, then you will soon receive a new and better model of that object. 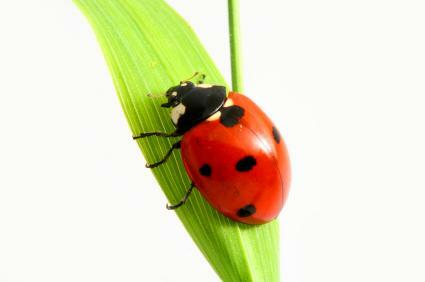 It's easy to add a ladybug symbol in your feng shui room design to reflect the belief that ladybugs bring good luck. Keep in mind any symbol addition into your feng shui design should look like a natural accessory. Don't go overboard with a roomful of ladybug objects. Too much of anything creates imbalance and defeats the purpose of adding the element.